Three top stylists share their beauty truths (and other obsessions.) 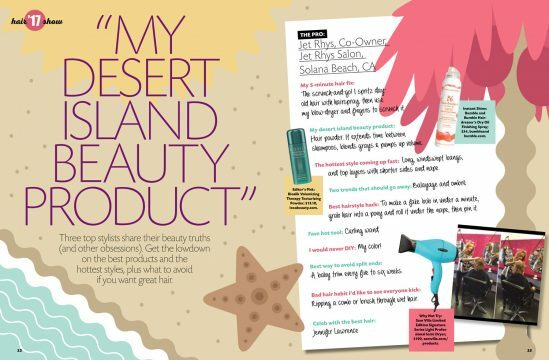 Get the lowdown on the best products and the hottest styles, plus what to avoid if you want great hair. The scrunch-and-go! I spritz day-old hair with hairspray, then use my blow-dryer and fingers to scrunch it. Hair powder. It extends time between shampoos, blends grays and pumps up volume. Long, windswept bangs, and top layers with shorter sides and nape. To make a fake bob in under a minute, grab hair into a pony and roll it under the nape, then pin it. A baby trim every five to six weeks. Ripping a comb or brush through wet hair.